Lifetime Radon Solutions, Inc. has been serving Wisconsin homeowners and their families for over 20 years. Installing radon mitigation systems in Fond du Lac County, and the Fox Valley area to the north, is our primary service and specialty. In addition to radon mitigation, our experienced radon technicians specialize in radon testing services in the Fond du Lac area as well. Our radon mitigation company was originally founded in Delafield, Wisconsin. Since then, awareness of radon has grown, and so have we. Currently, our team services all of Wisconsin for radon mitigation services and most of the state for radon testing services. We have our main Lifetime Radon headquarters, still family owned and operated in Delafield, with multiple satellite offices throughout the state. Lifetime Radon Mitigation Fond du Lac is one of our fastest growing satellite locations and the demand for radon mitigation in Fond du Lac continues to grow. If you are interested in hearing more about Lifetime Radon, the dangers of radon exposure, or you would like to schedule a radon mitigation installation or a radon test, give us a call today! According to the EPA, nearly all of Fond du Lac County is considered a high risk for elevated indoor levels of radon gas. We specialize in short-term radon testing, long-term radon testing and radon remediation solutions like radon system installation, crawlspace depressurization and radon resistant new construction. From DIY radon tests to electronic monitor radon testing, we offer a wide array of radon testing options for any budget. Whichever method you prefer, the most important thing, is that you test your home! If your levels come back high (above 4.0 pCi/L), Lifetime Radon will be able to quote you on the spot and get you the proper radon mitigation system that you need for your home or commercial property. Our Fox Valley radon mitigation and radon testing office covers a wide range of the entire state of Wisconsin. Our Northern Wisconsin radon mitigation technicians travel everywhere north of Fond du Lac and east of Wausau. Below is list of the common areas our radon mitigation technicians travel to! Who is Lifetime Radon Mitigation in Fond du Lac? Lifetime Radon is Wisconsin's premier radon mitigation and radon testing contractor. Lifetime Radon Solutions, Inc. was founded in Delafield, Wisconsin in 1998 and has been family owned and operated for the last 20 years. Lifetime prides themselves on unparalleled customer service, exceptional work ethic and core values, the best warranties in the business, and fair, competitive pricing. 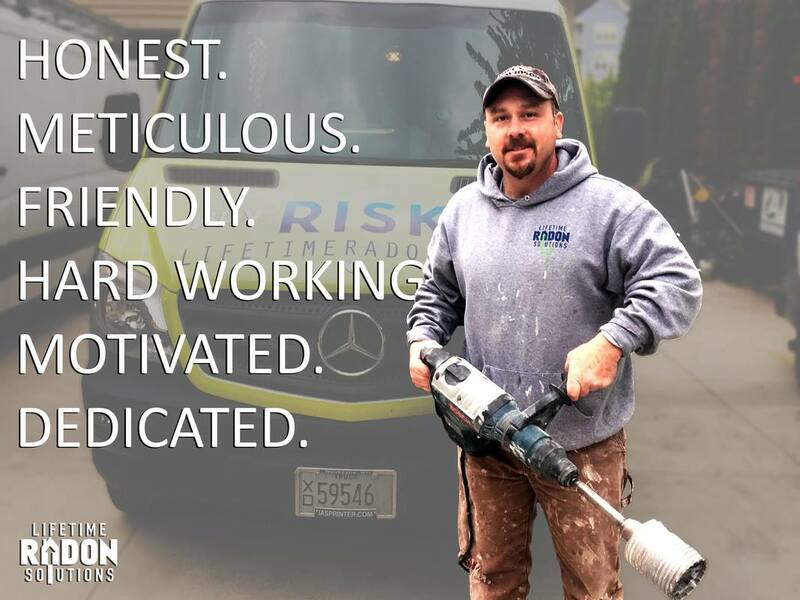 Our certified radon mitigation and radon testing technicians are employees, not sub-contractors, and our Wisconsin Corporation is fully-licensed and insured. Serving Wisconsin homeowners and local business owners is our calling. Our radon specialists take pride in helping families and Wisconsin property owners achieve cleaner air through radon testing, and ultimately radon reduction strategies. For the past 20 years, our local business has been growing exponentially. During the last two years, we have grown our business substantially in Fond du Lac, Oshkosh, Appleton and Green Bay. We now have local technicians in this area ready to serve the community without the long commute! What does Lifetime Radon Mitigation in Fond du Lac do? Lifetime Radon is a full-service radon mitigation and radon testing contractor. In addition to residential radon mitigation and radon testing, Lifetime specializes in commercial radon mitigation, commercial VOC mitigation, vapor intrusion mitigation and sump pump repair and replacement. Listed below are the services offered by Lifetime Radon Solutions, Inc.
Where does Lifetime Radon Mitigation Fond du Lac Operate? Lifetime Radon Solutions, Inc. services the entire state of Wisconsin and the vast majority of Minnesota for residential radon mitigation and radon testing. We thought this would only be proper to illustrate by showing some of Wisconsin's very common dairy heifers! We considered cheese, but leaving out the foundation of Wisconsin dairy just felt wrong. From a commercial perspective, Lifetime Radon Solutions, Inc. services the entire United States. Whether your project is large or small, our unrivaled experience and work ethic will ensure your local job, or out of state business, is properly mitigated for radon gas and other dangerous vapors. Check out our other locations for more information! Why Choose Lifetime Radon? Why Test or Mitigate My Property? Lifetime Radon Solutions, Inc. is Wisconsin owned and operated. With more than 20 years in business and over 35 years of combined radon mitigation and radon testing experience on our team, there are few radon situations we have not professionally encountered. Our technicians are NRPP (National Radon Proficiency Program) Certified and Lifetime Radon Solutions, Inc. is a registered member of AARST (American Association of Radon Science Technologists). Why Radon Testing and Mitigation? The EPA and Surgeon General recommend everyone test their home for elevated levels of radon gas. Furthermore, the #1 cause of lung cancer in non-smokers is due to prolonged exposure to elevated levels of radon gas. Approximately 22,000 people die each year from radon related lung cancer. Lastly, why risk it? The cost of a DIY radon test is generally far less than $50. For less than the price of dinner on a night out, you can test and have peace of mind that you, your family, and everyone who enters your home is breathing quality indoor air.